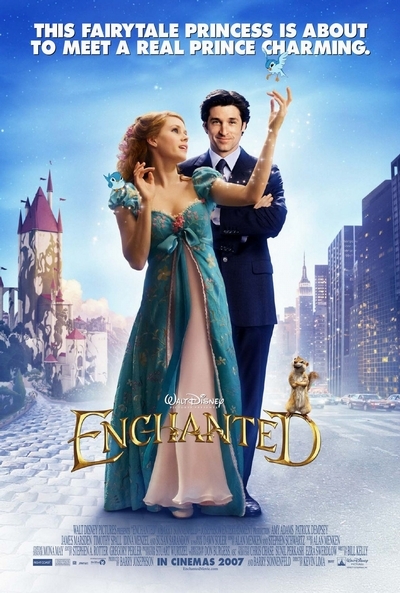 Story: A classic Disney animated fairy tale meets with the modern, live-action romantic comedy in Walt Disney Pictures' "Enchanted." Featuring an all-star cast, the film follows the beautiful princess Giselle (Amy Adams) as she is banished by an evil queen (Susan Sarandon) from her magical, musical animated land and finds herself in the gritty reality of the streets of modern-day Manhattan. Shocked by this strange new environment that doesn't operate on a "happily ever after" basis, Giselle is now adrift in a chaotic world badly in need of enchantment. But when Giselle begins to fall in love with a charmingly flawed divorce lawyer (Patrick Dempsey) who has come to her aid - even though she is already promised to a perfect fairy tale prince (James Marsden) back home - she has to wonder: can a storybook view of romance survive in the real world?